So here we are at January blues time – not even a week back to work, and already the media are trying to convince us that January is the most depressing time of the year. Coaches are coming up with tips on how to beat the January blues because in theory we are all feeling rubbish after Christmas, and this is just going to get worse and worse, culminating in the pit of depression on Blue Monday, which falls on January 15th in 2018 if you are interested. 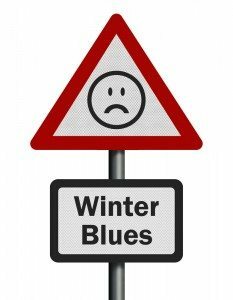 What are the January blues? I open up Sainsburys Magazine and there is an editorial about how everyone is just too tired and skint, and most of them are depriving themselves on diets and Dry January, and the weather is just so pants and the days are just so short, that of course there is every reason to be depressed. Then of course there are credit card bills, tax returns, and shops full of January Sale tat which is not worth buying. And the alarms waking us up in pitch darkness and reminding us its time to go to work and school again. So why don’t I suffer? And yet, as usual I’m not at all down – I must just be a crazy person. Now don’t get me wrong – I suffer from my fair share of SAD along with everyone else. My down mood (not really accurate to call it depression, and I don’t wish in any way to belittle those people who get real depression) begins when the clocks go back at the end of October, drags on through gloomy November and intensifies in December as the stress of preparing for Christmas coincides with the worst of the dark, cold, gloomy weather. But then you get the solstice and the kids break up from school. Santa comes and we settle into a dreamy food-fuelled hibernation. The kids (including my husband) have new toys and everybody plays nicely for a week or so. What’s not to like? During the Christmas holidays I get time to sit and plan. I make goals,have dreams, and suddenly 2017 looks like an amazing new world, a world in which everything is going to be OK, much more clean, sparkly and exciting than the grotty old year which has just been. Hogmanay comes and I smile sweetly and wish everyone a Happy New Year – and I really mean it! So right now I’m not depressed at all. I can already see the evenings getting lighter and the mornings will start pretty soon. My resolutions plans and goals are still holding firm for now and I can still believe that this year is the one when all the good things are finally going to happen. I don’t deprive myself in January – I take care of myself. I’ve been dry for three years already as alcohol no longer agrees with me and I certainly don’t miss the migraines and heart palpitations. And I’m not dieting – in fact I will never diet again, as I use Slimpod from Thinking Slimmer to keep my weight under control and that is so much easier and more fun to do than any gloomy diet. Right now I’m looking out the window and the sun is shining. 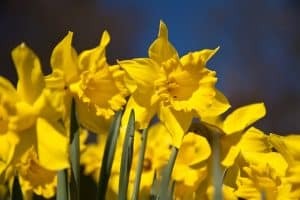 I’m just about to take the dogs for a walk and see the new daffodil bulbs poking out all over the park. I’ve eaten and drunk healthily and I feel fantastic in myself. My health is good and my body is back on the path to where I want to be. On the days when the weather is not so great we have an open fire, and there are warm woolly jumpers, blankets, hot baths, soup, roast dinners and coffee. It’s warm cosy and comfortable – dare I say hygge?. If you have to go out and get wet and cold it’s only a short time till you come back in and get dry again. And to top it all I’m back to singing after the Christmas break – the little bit of weekly me time which keeps my brain active and keeps me sane. Am I the only one who doesn’t buy into all this depressing January nonsense? As far as I can see January is heaps better than the preceding two months and will get better still all the way to Summer. What’s not to like? Begone January Blues, I am a child of the Spring.